I have a strong passion for the history of Seattle. I especially love seeing how homes have changed and neighborhoods have formed. What a remarkable transformation our city has been through! I often wonder if the people who grew up in Seattle during the early 1900's could even remotely fathom how their city would change over the next century. I think it is extremely important to know and honor our past. Our city has made some great improvements, some unfortunate choices and survived its share of turbulent times. Overall, we are a pretty progressive community. 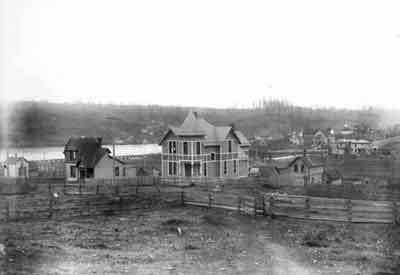 A building boom started in Ballard after it was incorporated in 1890. Building streets was a real challenge. Loggers cut the trees, and teams of horses and mules dragged the stumps out of the ground. In a few cases, routes were laid out around stumps that couldn't be pulled. The streets then had to be cleared of debris, plowed, harrowed, and graded. Crews laid down wooden planks on some streets to make it easier to travel in mud. Ballard Avenue looking SE; 190_ In 1887, the town of Ballard was founded across Salmon Bay from Seattle. Many of its earlier residents were Scandinavian fishermen and their families. 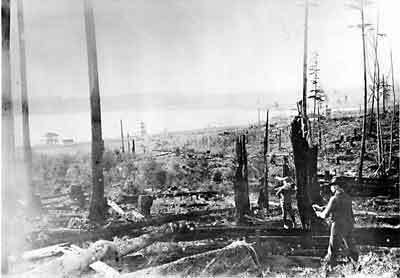 After the 1889 fire destroyed Seattle's business district, including Yesler's Mill, the lumber industry moved to Ballard. By 1904, the town had 10,000 residents. Most of the men either fished or worked at the lumber and shingle mills. 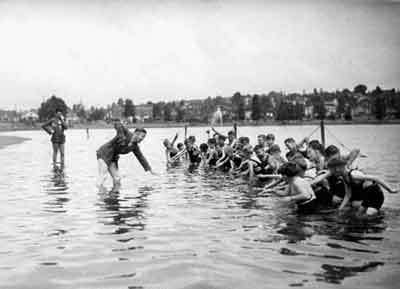 Children in a swimming class at Green Lake; 1934 For many years, Seattle residents have gone swimming in Green Lake. An annual water festival opened in 1931, and the city's first annual high school swim meet was held there two years later. By 1934, the Seattle Post Intelligencer was sponsoring regular swimming classes. Many of Seattle's swimming champions of the 1920s, 1930s and 1940s got their start in Green Lake. Beginning in 1888, electric streetcar lines were being built in many parts of Seattle. 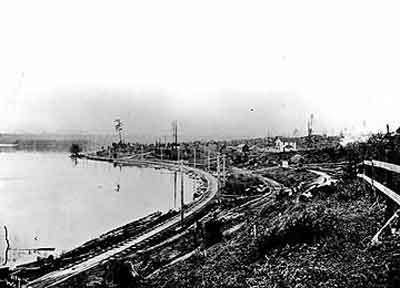 The Green Lake Electric Railway was begun in 1889 to serve the area north of Fremont. The tracks followed an old logging railway route and ran along the eastern shore of Green Lake, ending at about North 70th Street. Green Lake freezes rarely, but its shallow depth and still waters mean that it can freeze quite fast. Skaters flocked to the lake whenever it froze. In order to ensure safety, the Seattle Parks Department decreed that the ice had to be six inches thick before skating would be allowed. This only occurs during the coldest winters. 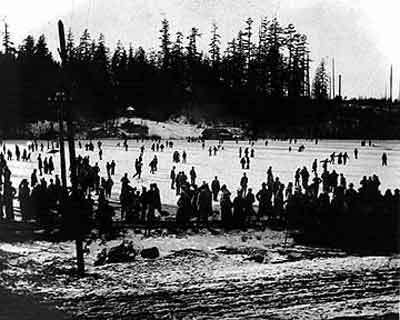 This photo shows skaters on Green Lake during the early years of the 20th century. It was probably taken in 1906, when park records indicate cold temperatures and an active "skater patrol." 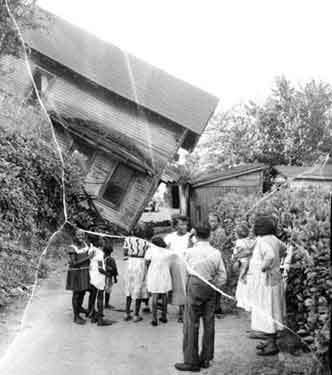 Late one August afternoon in 1953, a wood frame house in Seattle's Central District on 24th Avenue slid off its foundation into the alley below. The unoccupied dwelling fell into the alley when its supporting posts gave way, and the crash was heard for several blocks. Neighbors crawled inside to rescue the owner's frightened dog. In the 1930s, Seattle's northern city limits were at 85th Street, in the Greenwood neighborhood. People could take the streetcar to Greenwood and catch the interurban railway north to Everett and other outlying towns. 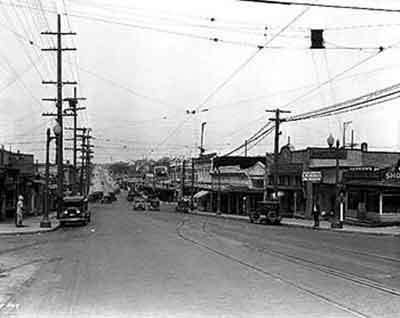 This photo shows what the Greenwood business district looked like around 1932. Arlen H. Towle and Frank N. Wilcox were architects and partners in business. 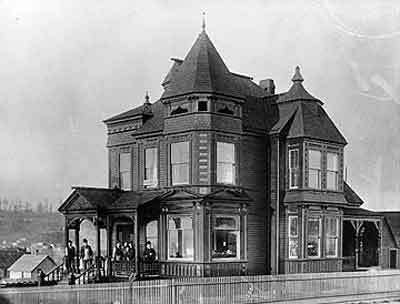 In 1890-1891, they built a house at the southwest corner of 22nd Avenue South and Yesler Way, in what is now the Central District. This photo shows the Towle-Wilcox house with its fancy shinglework, ornamental woodwork, and turreted towers. This type of architecture, called the Queen Anne style, was very popular in the 1890s. Recycling is a relatively new word, but it's not a new idea. For years, people have bundled up newspapers to sell them back to pulp and paper mills. In many communities, this was an easy way for households and groups to raise money. 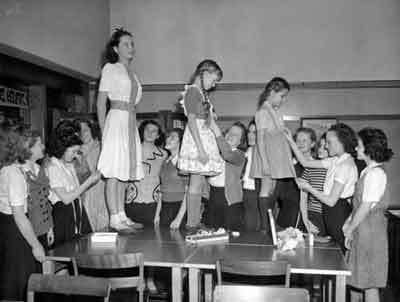 During World War II, many of Seattle's school children collected newspapers as part of the war effort. 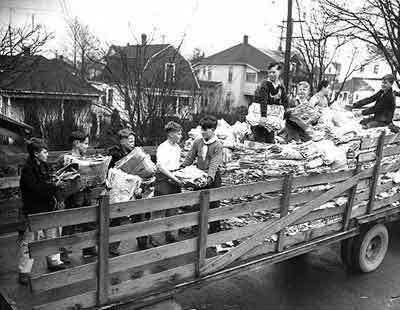 This photo, taken in March 1945, shows a group of Seattle school children piling newspaper into a trailer during a paper drive. 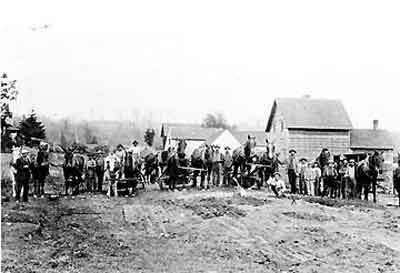 In the 1890s, at least part of what is now Seattle's Central District was still rural. 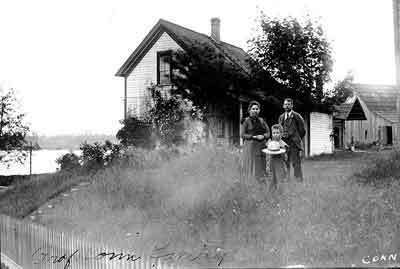 This photo from that time period shows a family outside their wood frame home at 193 20th Avenue in Seattle. This would place the house somewhere near what is now the intersection of 20th Avenue and Spruce Street. In 1891, a new Latona School building was built in Wallingford. 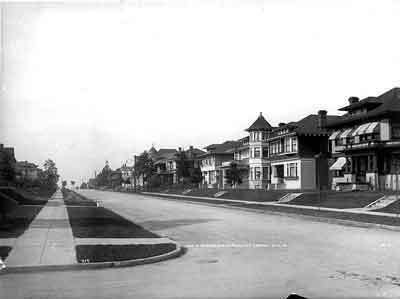 This was the same year that the neighborhood became part of the city of Seattle. The wood-frame school had four large classrooms and four teachers, each paid $900.00 for the year. 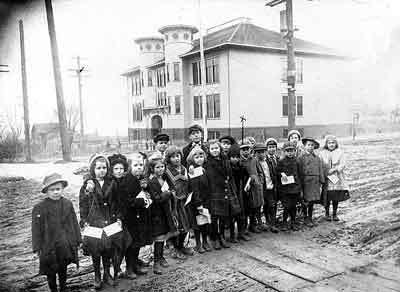 A new, larger school was built next door in 1906, and the older building was torn down. Although backyard vegetable gardens have been popular for years, they were especially common during World War II. All over the United States, people turned unused yard space and vacant lots into Victory Gardens to raise fresh produce. 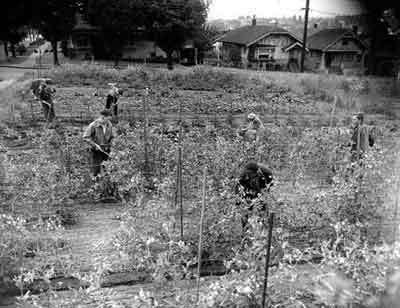 This August 1944 photo shows people working in a Victory Garden in the 2300 block of Corliss Avenue, in Seattle's Wallingford neighborhood. The Victory Gardens provided a place for neighbors to get together and raise their own food. When the United States entered World War II in December 1941, workers were already pouring into Seattle to work at Boeing and other war industry plants. 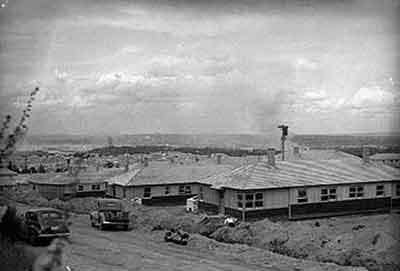 The Seattle Housing Authority rushed to complete High Point in West Seattle to house some of the war workers. Some 650 carpenters and other laborers built 700 homes, mainly duplexes. The homes, most of which housed two families, are spread across the hillside overlooking Elliott Bay. 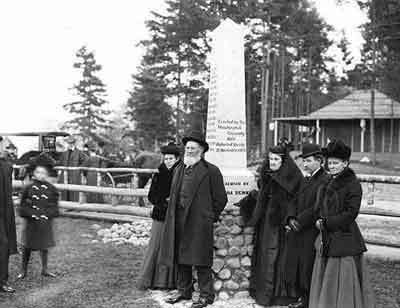 On November 18, 1905, the surviving members of the Denny Party gathered at their old landing place on Alki Beach to dedicate a monument to the founding of Seattle. According to the inscription, the monument was erected by the Washington University State Historical Society and presented by Leonora Denny. This photo shows the remaining pioneers standing by the monument. The bearded man standing closest to the monument has been identified as Carson Boren. During World War II, many women were trained to fill the jobs left by men serving in the military. Women did auto repair, aircraft assembly and other jobs once considered men's work. 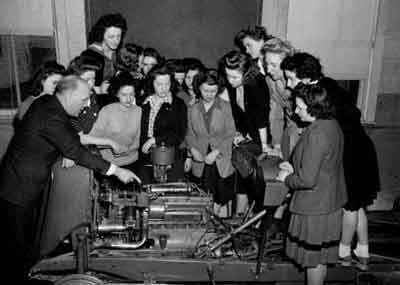 This photo, taken in West Seattle in February 1943, shows young women studying a car engine. The auto mechanics class may have been photographed at West Seattle High School. 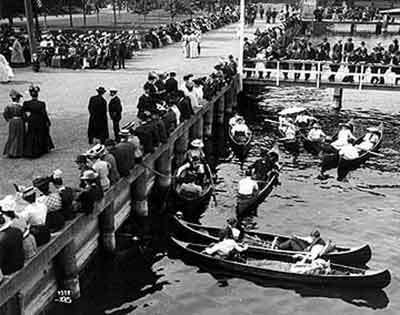 Crowds and canoes at the waterfront in Leschi Park; 1911 Leschi Park, on the shore of Lake Washington, was a popular place for Seattle's city-dwellers to go for recreation. Many people caught a cable car at Pioneer Square and rode to the park along Yesler Way. 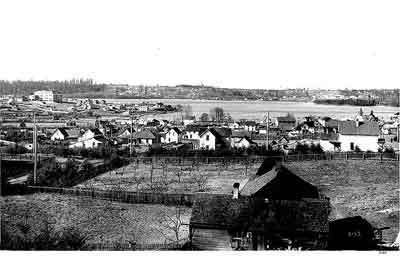 In this photo, taken at Leschi Park around 1911, some people sit or stroll. Others relax in their rented canoes. The men and women may seem formally dressed by late 20th century standards, but this would have been typical clothing for a summer outing in 1911. Before the opening of Seattle's Pike Place Market in 1907, farmers sold their fruit and vegetables to the customer through brokers or other middlemen. Much of this wholesale produce trade took place in the so-called Commission District, in the area of Railroad and Western Avenues and Columbia and Marion Streets. 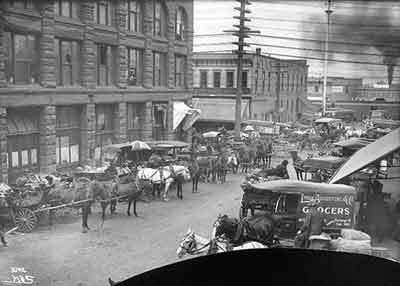 In this photo, taken around 1905, grocery wagons fill Marion Street in Seattle's Commission District. Western Avenue crosses in the center, near the utility pole. Railroad cars on Railroad Avenue block the view of the West Seattle Ferry dock. Judge Thomas Burke and his wife Caroline had a large home on Seattle's Boyleston Avenue on Capitol Hill. They built a summer home, which they named Illahee, on the western shore of Lake Washington. 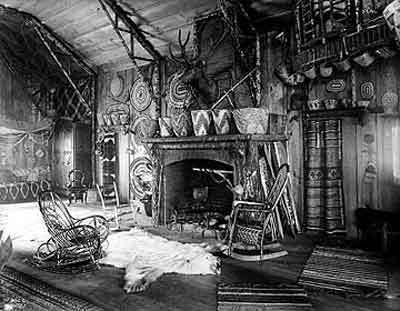 This photo, taken by Anders Wilse between 1897 and 1900, shows the living room at Illahee. The Burkes have followed one of the fashions of the times and decorated the room with bentwood furniture and Native American basketry. The floors are covered with polar bear skins. 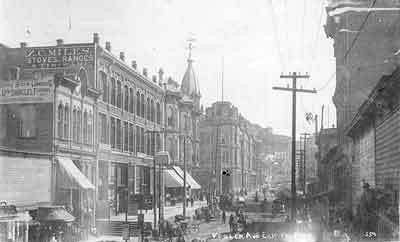 After news of Klondike gold reached Seattle in July 1897, many of Seattle's stores joined the excitement and became gold rush outfitters. Cooper & Levy, just south of Pioneer Square, provided gold-seekers with crates and sacks of flour, bacon, dried fruit, condensed milk, tea, soap, matches, and many other items needed for life in the north. 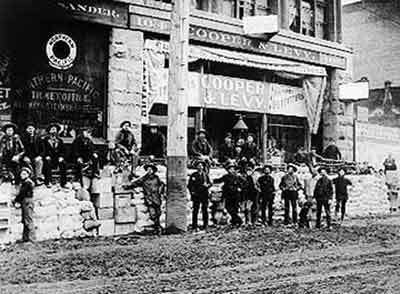 This 1897 photo shows a group of gold seekers outside Seattle's Cooper & Levy grocery store on First Avenue South. 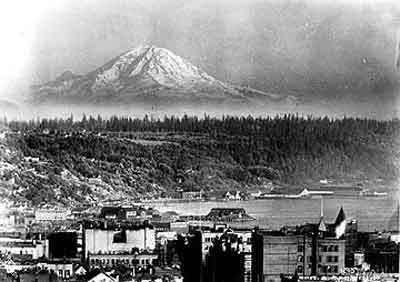 In 1900, Anders Wilse stood on top of Denny Hill to take this photo of downtown Seattle, Beacon Hill, and Mount Rainier. At that time, much of Beacon Hill was still wooded. Mount Rainier seems to float in the distance. The Pioneer Square area is in the lower right of the photograph. 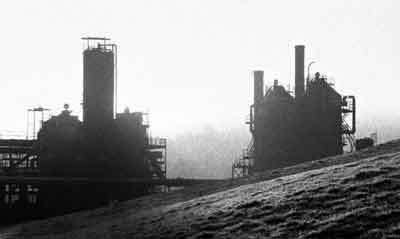 Seattle City Light built a coal-burning steam plant in 1906 to generate electricity for the growing city. 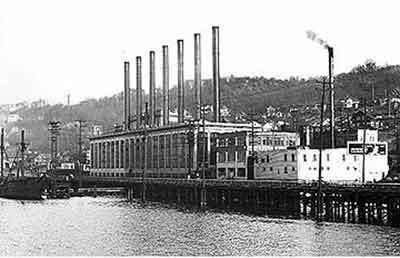 With its large windows and smokestacks, this distinctive building on Lake Union is still a landmark. The power plant operated until 1984. It is now the home of a research company which has preserved the building's earlier character. 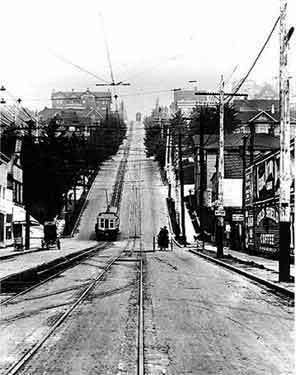 Cable cars were well suited to Seattle's steep hills. 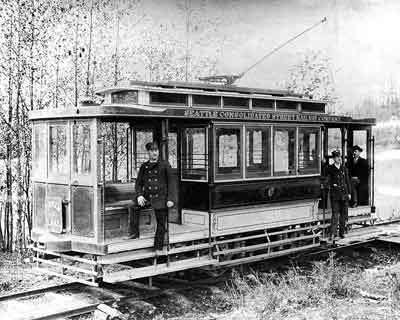 The North Seattle Cable Railway Company began construction on the Queen Anne cable car line in 1890. On Queen Anne Avenue, the car was linked by cable to a 16-ton counterbalance weight. As the weight slid down the hill in its underground tunnel, it pulled the cable car up. When the cable car came down the hill, it pulled the weight back up to the top. 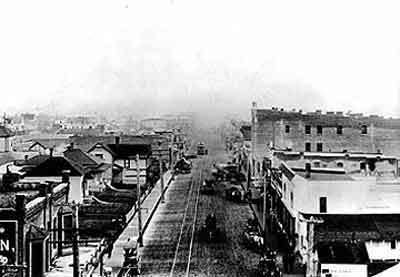 This photo, taken around 1900, shows two cable cars on Queen Anne Avenue, in the area some people still call "The Counterbalance." The huge weight is underground and cannot be seen in the photo. The counterbalance system stayed in operation until 1940. 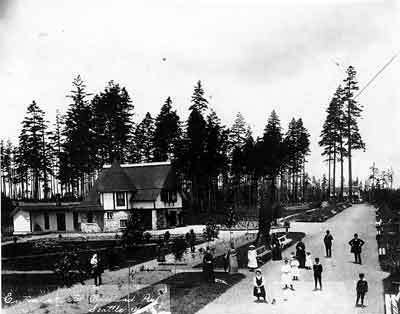 Woodland Park prior to its acquisition by the City of Seattle from its owner, Guy Phinney in 1900. The Lodge (or gatehouse) Hotel in right background. At the left entrance of Woodland Park is where Guy Phinney passed away. 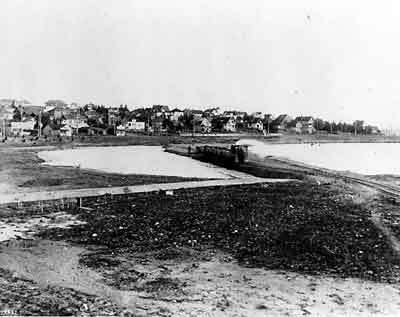 A portion of east Green Lake was drained and filled-in as part of a land reclamation project. 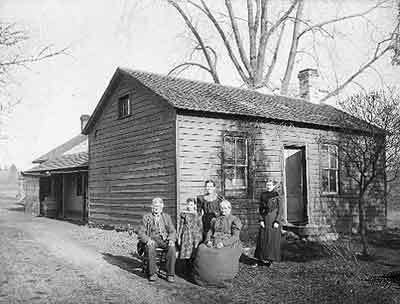 William D. Woods' home where Greenlake Post Office now stands. George A Conn was the principal of the Latona School. The log cabin, which is barely visable behind the main house (in front) was the first building built at Greenlake. 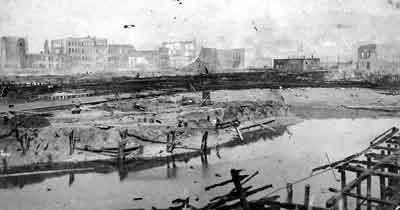 Aftermath of the Great Seattle Fire of June 6, 1889 showing the waterfront and 1st Avenue. Picture shows station house of the Green Lake Electric Railway Company and water tower of a sawmill built by A.L. Parker. The original Green Lake School (which was only two rooms) is on the hill. Greenlake Public School at the far left. Woodland Park in the left background. As cars got less expensive and people had more free time, many people started to take car camping vacations. They camped in farmyards, by the roadside, or in city parks. Cities and towns soon started building organized campgrounds. 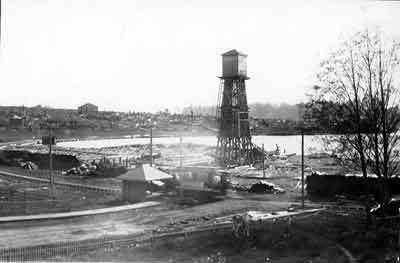 In 1920, Seattle's park department opened an "Automobile Tourist Camp" in the northern part of Woodland Park, overlooking Green Lake. 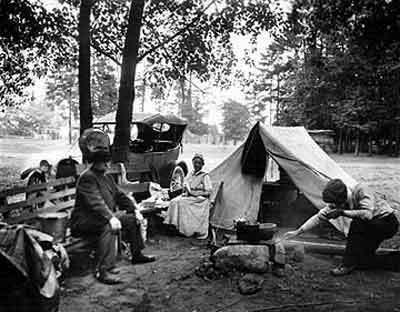 This photo shows people camping at Woodland Park sometime between 1918 and 1920. Their tent is set up and ready, and their meal is cooking on the fire. King County Snapshots presents King County, Washington, through 12,000 historical images carefully chosen from 12 organizations' collections. These cataloged 19th and 20th century images portray people, places, and events in the county's urban, suburban, and rural communities.